At its heart, county music is about the struggles we face and our efforts to overcome them. 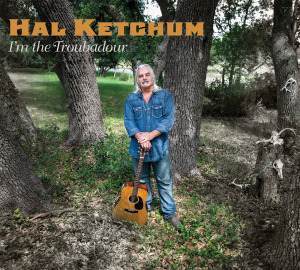 Few artists know more about struggle than veteran country musician and songwriter Hal Ketchum. After his diagnosis with Multiple Sclerosis (MS) several years ago, Ketchum went into a self-imposed exile in the small, idyllic community of Wimberley, Texas. Living in a cabin, Ketchum spent his days and nights struggling to get a handle on the physical and mental consequences of his condition, including periodic bouts of blindness and paralysis. 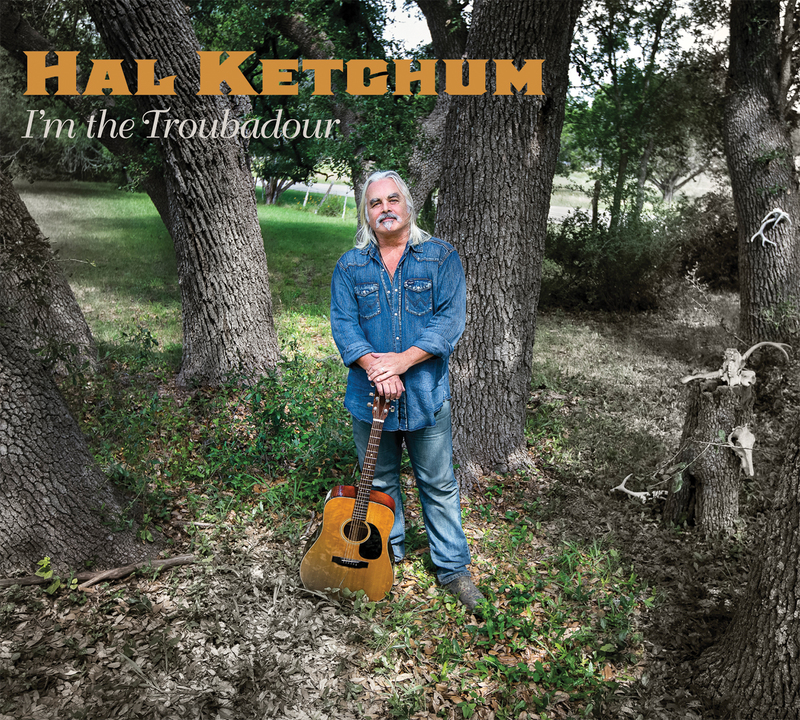 With the release of I’m the Troubadour, Ketchum is back. Not only is this his first studio album in six years, it is a significant artistic milestone. Already celebrated for world class country music, including “Small Town Saturday Night” and “Past the Point of Rescue,” this new album showcases his mastery at weaving genres such as folk, blues, rock and soul into his signature country sound. At the same time, talking frankly about his “deep level of depression” and being in a “dark place,” Ketchum isn’t whitewashing the hardship and suffering of recent years. “I had pretty much thrown in the towel. I wasn’t interested in putting out another big country album. I’ve done that. I’ve been there, man,” he explains. Ketchum found a perfect partner for the new album in Music Road Records. The Austin-based label backed his vision of a record free from genre restrictions and commercial pressures — an album that simply would let Ketchum be Ketchum. The focus of I’m the Troubadour is clearly on Ketchum’s songwriting and vocal abilities but its instrumentation is worth a listen as well, especially the guitar and keyboard work. His new, multi-genre approach is highlighted by the album’s title track, delivering solid country-rock with smoky blues undertones, a strong percussion line and gorgeous electric organ interludes. His physical and mental struggles have not diminished the strength of his voice or vitality of his lyrics. If anything, they appear bolstered by a passionate urgency. While well reflected in “I’m the Troubadour,” the album’s multi-genre approach is most gloriously explicit in “Drive On,” a blues-country piece with strong hints of R&B and great percussion work. Its guitar line, reminiscent of Garth Brooks’ “Rodeo,” owes more to rock than country. Opening with solid instrumental work, “Days Like This” is like a William Wordsworth poem as interpreted by a country musician. A masterfully-crafted song, it rich lyrics celebrate the beauty of nature and the precious rarity of perfect days. Another great genre-bender is “Sweet Loreen,” which walks the line between blues and outlaw country. It opens with old-school blues guitar work before settling into a bass boogie-woogie and country guitar work. Part story song, part lover letter to singer’s muse (the eponymous Loreen), it is set in Terlingua, the celebrated West Texas ghost town turned cowboy-hipster haven. Love songs are heavily represented among the album’s tracks and, in the finest tradition of roots music, “sad” has a distinct numerical advantage over “happy.” It is a testament to Ketchum’s ability as a songwriter that, even with a multitude of such songs on I’m the Troubadour, each one feels musically and lyrically distinct. “Baby I’m Blue” is an easy-rolling light country rock. Blending sad with up-tempo, “You Loving Me” has a definite 90s country radio sound which is reinforced by the rock-influenced guitar accompaniment. “I Know Where Love Lives” is a country-rock duet which feels like a lost track from The Eagles. “Stay Forever” offers a slow country piece with a 70s flavor. And, if that is not your reviewer’s favorite period of country music, he also cannot deny this track contains some of the finest vocal work on the album. “I Shall Remain” is notable both for its happy ending and the emotional impact of Ketchum’s singing. “Lord Help Me Please” adds sweet, strong undercurrents of Memphis Soul and Southern Gospel to the classic country theme of trying to win the hand of a churchgoing beauty. “The Saddle” is a twist on the country love song. This time, the love is familial rather than romantic, as the song chronicles a grandson’s love for his grandfather. Musically, it brings obvious county and even western flourishes appropriate to the song’s title. One of the most powerful and moving tracks on the album, it is at once heartwarming and bittersweet with strongly visual lyrics exploring both coming of age and learning to lose those we love. “New Mexican Rain” is, musically, the most atypical song on I’m the Troubadour: rolling smoothly onward like a contemporary jazz soundscape. The piano work on this track is ethereal— if about the farthest thing imaginable from country. But, if you look (or, rather, listen) more deeply, its lyrics are classic Ketchum: painting a vivid portrait of New Mexico as a backdrop for another tale of love gone tragically awry. Knowing the back story, it is tempting to see the fingerprints of Ketchum’s recent struggles and victories throughout I’m the Troubadour. Lyrics such as the title track’s “Cross myself and lead my band through every beer joint through this land. True salvation to the core, I’m the troubadour” and “Ain’t no need to worry what tomorrow brings. Ain’t no need to change a thing. Brother, I can tell you that if I had wings, I could fly and never fall” from “Days Like This” speak of one who is intimately familiar with tragedy and triumph— reflecting everything Ketchum has gone through to find his place in the world again and simply to turn the dream of a new album into a reality. And Ketchum has triumphed, both personally and artistically. If I’m the Troubadour is any indication, his victory is ours as well — signifying many more years of great music and songwriting.